Rejecting the reality of the world around me, one page at a time. I am the reader in the dark, the Devourer of cake in cafe’s… Who am I? I’m Batm… No wait, I’m Hisham! Reviews: What’s Up With Your Reviews? SF/F Read Alongs – A guide. 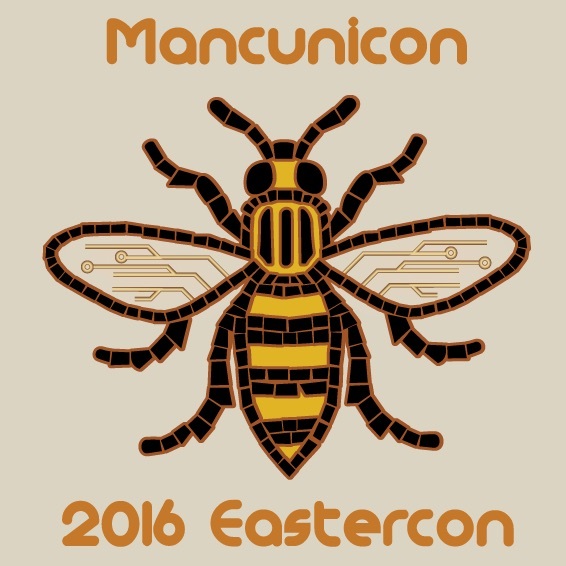 Mancunicon 2016 – An Eastercon BEEyond! Apparently innocent passersby assumed Mancunicon was for Bee Keepers! You’ll be pleased to know that since my last post, the roomie sharing our room was not in fact a time-traveling cyborg assassin from the future. Or at the very least refrained from killing all humans until after the convention. Yay! I wanted to volunteer and help out in some capacity at this convention, however the day before we arrived into Manchester I had a severe migraine, so I was still feeling incredibly delicate right up until Sunday afternoon. Migraines aren’t fun, and the post-migraine symptoms for me can persist for days sometimes. For the same reason, I wasn’t able to attend as many panels and events as I had wanted. That being said, here’s my writeup on Mancunicon 2016! Day 1, Friday 25th March. Mancunicon kicked off on Friday the 25th of March (Good Friday, because EASTERCON! Get it?) with a short and sweet opening ceremony where the convention guests of honour were introduced. They were (and still are!) Aliette de Bodard, Sarah Pinborough, Ian McDonald and David L. Clements. We were also introduced to the people in charge of running the convention, weirdly, they were all named Dave – even the women! (Manchester is a strange place! 😉 ) There was a quick reminder of the convention policies, and a plea to eat & drink enough for the food & drink target budgets to be hit. (This seems to be a traditional plea!) Were then set free to enjoy the programming! Best Meganovel panel, Mancunicon 2016. The first panel I watched was titled the “Best Meganovel” (13:00 rooms 8-9) where Carol Connolly, Marcus Gipps, Farah Mendlesohn & Phil Dyson were moderated by Johan Anglemark. This panel basically discussed the proposed new “Best Series Novel” Hugo award and how it could or couldn’t work. Will such an award ever get ratified and come into being, I don’t know. But people definitely have… opinions! Twisting The Story panel, Mancunicon 2016. The second panel I got to enjoy was “Twisting the Story” (14:30 rooms 8-9) with Charles Stross, Susan Bartholomew, David Tallerman, Chris Wooding and Sebastien de Castell who were ably moderated by Gillian Redfearn. Here there was much discussion from the panel on how, why and when plot twists should/shouldn’t be used. Naturally a lot of well known plot twists from Literature, TV, Games and Movies were referenced as examples. Many nuggets of wisdom were given and discussed by the panel, including: “Twists recontextualise what you have already read!” with regards to a re-read after a twist is already known. (Charles Stross). “A twist has to make sense in consideration of its set-up.”(sorry, I can’t recall who said that). A very lively and interesting discussion all around! Follycon will be the 2018 Eastercon in Harrogate. Next up for me was the “Docent Tour” at 16:00 I met in the hotel lobby with Alison Scott who led the tour. This was an interesting walk, a behind the scenes glimpse at the organised chaos of running an Eastercon. Alison is the Social Media Manager for Mancunicon 2016 and is the Chair of the winning bid team for Eastercon 2018, Follycon 2018 to be held in Harrogate. Alison dragged us around on a merry tour of the convention introducing us to various people behind the scenes as and when we ran into them. I’ve volunteered at a convention several times before (Dragon Con) but never at a UK convention. So it was interesting to see an overall view of the convention apparatus. I’m definitely going to volunteer at the next UK convention (If they’ll have me) I attend, the only reason I haven’t this year is health related (see beginning of post). There were several other Docent Tours scheduled throughout the convention, with other senior Mancunicon figures. I recommend taking such a tour if they’re operated at any convention, they’re quite interesting! The view from our room on the 12th floor of the Hilton Deansgate. Whose Line Is It Anyway?, Mancunicon 2016. After an entertaining, but exhausting first day. I retired to our hotel room for rest and slumber. Day 2, Saturday 26th of March. I woke up on Saturday feeling very delicate. Sadly this wasn’t alcohol related, but my body complaining I’d pushed it too far on Friday so soon after a Migraine. Indeed, after making a not so quick trip to a nearby Boots for pain relief, the first scheduled event I attended wasn’t until 14:30. So I missed many interestingly sounding panels such as “A Feminist Fantasy Canon“. Liz as Honey Lemon (Big Hero 6). Saturday was also the main day for Cosplay at the convention. (Convention attendees were all issued with 3x cosplay tokens to hand out to awesome examples of cosplay. The more tokens earned, the greater the chance of winning a prize). Eastercons don’t generally attract many cosplayers, which is a shame. Cosplay can be fun for both the cosplayer and other attendees of a convention. (My friend Lea Fletcher, Cosplayed as Daredevil on Saturday, pictured above right.) Of the several cosplay examples wandering around the con, my favourite was a lady named Liz cosplaying as Honey Lemon from Big Hero 6! (above left). The Merchant Princes Series by Charles Stross. I highly recommend them! Best Novel Award ~ The House of Shattered Wings by Aliette de Bodard. Best Non-Fiction Award ~ Rave and Let Die: The SF and Fantasy of 2014 by Adam Roberts. 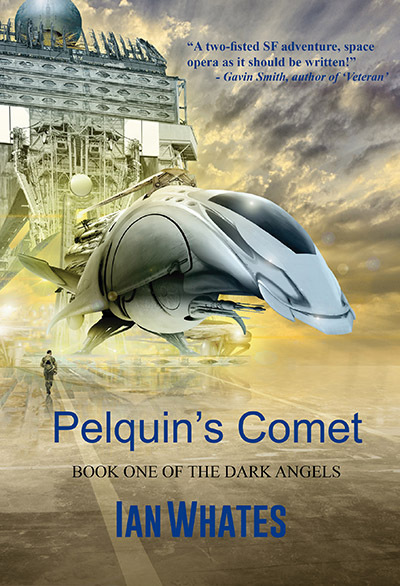 Best Artwork Award ~ Jim Burns for the cover to Pelquin’s Comet by Ian Whates. For more on the BSFA Awards, including a list of past winners, go to the BSFA site. At 19:00 I wanted to attend the “I Love Boardgames!” panel in room 6. But the room was tiny and the turn out was huge. I couldn’t get into the room. Booooo! At 20:30 in The Presidential Suite, there was “That Which We Call Reality, By Any Other Name…” Sadly, although I did manage to get in, I was right at the back of a long narrow room and couldn’t hear the panel properly. This room lacked any microphone/sound equipment set-up. At 22:00, due to popular demand (and a twitter/word of mouth campaign by a certain convention guest *cough*Gillian Redfearn*cough*) there was the “Surprise Disco” in Deansgate 2&3. My friends seemed to enjoy it, sadly I had to retreat as my migraine was threatening to relapse. (When you can physically feel the shifts from red <-> green of the disco lights in your eyes, you need to go lay down somewhere). So I returned to the hotel room and did just that. Day 3, Sunday 27th March. I woke up on Sunday feeling a lot better, which boded well for the day. If You Don’t Scream You’ll Laugh, Mancunicon 2016. Book Reviews In The Age Of Amazon, Mancunicon 2016. Next up at 13:00 was “Book Reviews In The Age Of Amazon” (Deansgate 3). Chris Kammerud, Glyn Morgan, Sarah Pinborough, Martin Wisse and Martin Petto discussed and debated the importance of book reviews on platforms such as Amazon and Goodreads as opposed to traditional reviews in newspapers, magazines or even book blogs. The panel had a book blogger, a book seller (attending in a personal capacity with no association with the employing retailer!) and a published author amongst them, so it was a lively debate. Subjects such as “risking a bad review/stop receiving review copies?”, “The importance of a certain number of reviews on Amazon for new writers/Amazon Algorithms!” among many others were brought up. 13 Minutes by Sarah Pinborough. The Death House by Sarah Pinborough. A quick dash for a snack later, then straight upstairs to the second floor to room 10 for the “Kaffeeklatsch with Sarah Pinborough“at 14:30, As I mentioned earlier in this post – Sarah is a DELIGHT! She’s got a bubbly personality and has many “Interesting” anecdotes to share. She answered questions amongst others about her teaching career, writing career and gossiped about her recent glam LA experiences. (Ask her about what happened to her cardigan at an important meeting! 😀 ). Sarah also chatted to her fans and asked THEM questions. It was and she is, great fun! Soon after, at 16:00 was the “Guest of Honour – Aliette de Bodard” event (Deansgate 2&3). An hour of insightful and fascinating interview with Aliette de Bodard by Kari Sperring. We then ventured OUTSIDE the hotel for more varied food options. (I know, scary!) Then returned to the room for a rest. Satellite 5 Convention Logo, Glasgow 2016. At 22:30, some of us ventured back down to the second floor for the “Satellite’s Pub Quiz” in room 8&9. A geeky pub quiz event hosted by the Satellite 5 Con team. Myself, my beloved Jenny and Lea Fletcher joined/formed a team (Team Spandexcellent) and we managed to come a respectable third place. We then returned to our room for packing chaos and sleep! Day 4, Monday 28th March. On Monday I don’t think there was a single attendee of Mancunicon who wasn’t exhausted. Monday was the only day that I didn’t avail myself to the hotel breakfast, purely because I could not get out of bed before 10:30. I eventually dragged myself downstairs and after a quick perusal of what was left of the dealer rooms went to the “Sense8” panel in rooms 8&9 (at 13:00). My partner Jen wanted to attend the “Place, Identity, Story” panel that was in room 6 but it was already maxed out when we arrived, so she tagged along with me. Luckily for Jen sane minds decided to organise a last minute swap of rooms as the turnout for the Sense8 panel was a lot smaller then the rooms capacity. I trooped out to room 6, Jen got to stay put and saw the panel she wanted. Win Win! The “Sense8” panel was moderated by Ian Snell and had Meg Frank, Tej Turner and Nick Hubble (I believe Julie McMurray was scheduled to be on this panel, but could not attend at the last minute because of the Art Show) discussing a show that is close to my heart. Themes of diversity were discussed heavily, not just in terms of gender/POC but also with regards to cultural representation on the show. If you haven’t seen Sense8, you really need to check it out. One panelist referred to it as “An 11+ hour pilot!” which is in reference to its complex intertwined – 12 episode story arc where no one episode really stands out as a stand-alone in the traditional TV mold. Sense8 is (sorry about this pun) Sense8tional! Next up for me was the 14:30 “Kaffeeklatsch with Aliette de Bodard” in room 10. Aliette chatted and discussed her recent BSFA award wins, favourite authors to read and a host of other subjects. Then at 16:00 it was time for the Mancunicon “Closing Ceremony”. People were thanked, prizes were given. Information about the 2017 and 2018 Eastercons were shared. For me, this was pretty much the end of the con. There were still some scheduled events (Gaming etc) but I needed to find food and do battle with the railway to get home. Overall, Mancunicon was an excellent convention. Bearing in mind that it was organized in a just under a year, it was run very well indeed. There were a few niggles I had, but most of these can be chalked up to the short preparation time the convention organisers had! Better monitoring of room capacity/management/swapping of rooms as necessary depending upon panel demand. Either more than one microphone for Audience Q&A’s so that so much time and energy wasn’t wasted by techs running across large auditoriums – OR a dedicated area in large rooms for members of the Audience to queue for the one microphone! Scheduled Author signings! The only way to get books signed at Mancunicon was to waylay an Author in a hallway/bar or before/after a panel. A dedicated signing session or two would have been better. A Disco pre-planned and scheduled. Every convention NEEDS a geeky disco! The Disco put on at the last minute was great, but a little circumspect as a result of last minute planning and the panel before it over-running! The 30 minute gap between scheduling was apparently controversial? I think it’s a good thing as it makes transferring between panels/events possible for those with accessibility issues. In fact my only issue with this policy was that some panels and events weren’t synced up to the same 90 minute time slots because of certain activities being scheduled for shorter or longer time-spans. But that’s a schedule planning issue. The 30 minute gaps also allowed everyone to grab a drink or snack between events – Always a good thing at a convention! The Freebie Table at Mancunicon. Of course, when I go to a geeky convention – I’m going to come back with loot. Mancunicon was no exception! As well as the many many books available to buy within the dealer rooms, there was also the seemingly obligatory freebie table. This table seemed to almost always be over-burdened by far too many books for the table to support. So I did my duty towards health and safety by taking some of them home with me! Thanks Mancunicon/Publishers. Maybe you’re going to attend a different convention, If so I hope you enjoy the experience. This entry was posted in Conventions, Events and tagged Aliette de Bodard, Books, BSFA Awards, Charles Stross, Conventions, Cosplay, David L. Clements, EasterCon, Follycon, Ian McDonald, Mancunicon, Sarah Pinborough by hishamelfar. Bookmark the permalink.